The American Milch Goat Record Association (AMGRA) was established in 1904. In 1964, the name was changed to the American Dairy Goat Association (ADGA). Milking goats were brought to the United States by settlers both at Jamestown, VA, and at Plymouth Rock, MA. Spanish mission settlements had already distributed milking goats throughout the Southwest and California during the 16th century. These animals were not of distinct breed type and descendants became known as common American milking goats. A USDA census in 1900 estimated them to number some 1.2 million. At that time, this goat population was largest in the rural south and southwest. 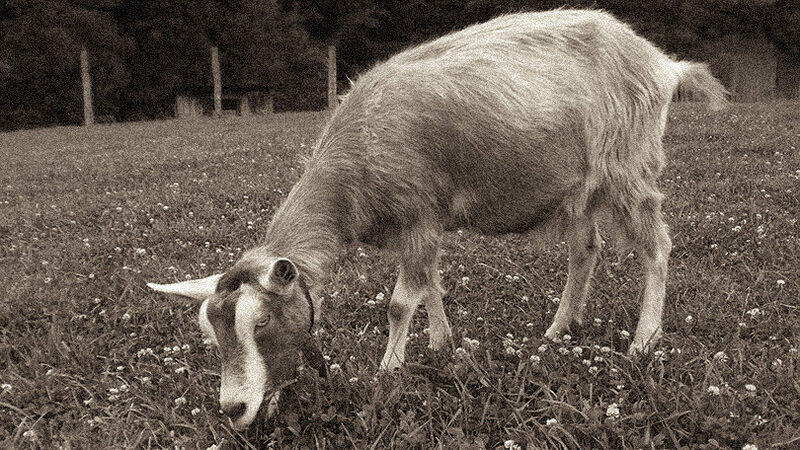 Interest in improved milking goats began in the reconstruction era following the Civil War. One of the first leading advocates was the Right Honorable Daniel Freeman Tompkins, who graduated in the 1849 class of the Harvard Law School. In 1879, he assembled a group of milking goats and began selective breeding to improve progeny. No purebred sires were available. The Bureau of Animal Industry (a subdivision of the USDA established in 1883) was tasked to promote multi-specie breed registration activity. Tompkins became the go-to-liaison for milking goats. The early goal was to develop does capable of producing two quarts per day. 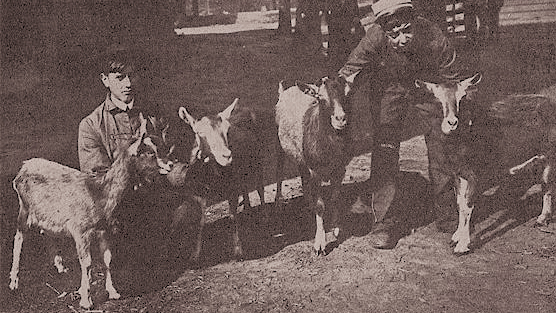 In the early 1890’s, he donated three such goats to the USDA, thereby establishing its experimental herd at Beltsville. The USDA actively promoted an association to encourage the establishment of a milk goat industry, and in 1895 Tompkins accepted the provisional chairmanship of the committee. In 1904, he would also function as superintendent of the dairy goat division at the Louisiana Purchase Exposition/St. Louis World’s Fair. In 1918, posthumous recognition of his pioneering achievements on behalf of the US dairy industry was acknowledged with the first honorary award given by the AMGRA Board of Directors. On July 11, 1893, William A. Shafor, Hamilton, OH, who was secretary of the American Oxford Down Record Association, imported four Toggenburgs from England. These were the first purebred imports; a doe kid born from the mating of two of these in 1898 would become Registration #1 when the AMGRA books were eventually opened in 1904. Formal organization of the American Milch Goat Record Association occurred on November 12, 1903. The specific impetus was the need for verifiable registrations on potential entries at the St. Louis fair. On May 25, 1904, sixteen Toggenburgs and ten Saanens arrived from Switzerland. The importer was F.S. Peer, Ithaca, NY, acting as agent for four buyers in MD, NJ, NY and MA. A few of the Toggenburgs owned by William J. Cohill, Hancock, MD, would be the only entries at the St. Louis event. A prime mover in the 1903 organization of AMGRA would have been Mrs. Edward J. Roby of Chicago, IL. Starting in 1895, she had assembled a sizeable group of common American milking goats. Registrations on six of these were specifically noted in Vol. I as to be for exhibition at St. Louis. However, a last minute interpretation of rules indicated that entries were restricted to imported pure breeds. There are no extant minutes of that 1903 meeting; legend has it that only three persons were present in that “smoke filled” backroom during the Fat Stock Show in Chicago: Mrs. Roby, Shafor, who became secretary, and the goat editor from the USDA, George Fayette Thompson, who became president. The primary registration requirement for those designated as “American” was to produce two quarts per day. Since so few purebred milking goats were available, it was understood that sires from those few available would be used to gradually upgrade the “American” population. Legal incorporation under Illinois law was filed May 31, 1905. Late in 1905, Thompson had gone to Malta and purchased sixty goats which he accompanied on a steamer back to a Maryland quarantine station. He contracted “Brucella mellentensis” (Malta fever) from drinking raw milk on the voyage and would die early in 1906. Mrs. Roby assumed the presidency, while Shafor continued as secretary. By 1907 when Mrs. Roby declined to continue, Shafor single handedly functioned as the entire executive branch. A mere 207 goats had entered the registration records and he was ready to throw it all in. That same year, the Bureau of Animal Industry would refer to Shafor a potential purchaser, J.C. Darst of nearby Dayton, OH. Darst not only purchased his first goat, but also agreed to take on the burden of secretary, a position he would hold until 1919. Shafor would continue as president until 1913. Darst’s appearance at this dark moment in early AMGRA history and his subsequent enthusiasm would eventually garner him the accolade, “The Father of US Capriculture”. In 1942, major revisions were made to the constitution to allow for direct voting by membership on directors nominated by district, as well as re-incorporation under Missouri law. While amended through the years, this same constitution is still in effect and incorporation remains in Missouri. Up until 1964, the address of the Association was wherever the acting secretary resided and varied from Ohio to Indiana, next to Massachusetts, then back to Ohio, and finally on to North Carolina. In 1964, the still used permanent office was purchased in Spindale, North Carolina. That same year, the name of the association was changed to American Dairy Goat Association. The first officially recognized National Dairy Goat Show was at the Illinois State Fair in 1946. The first Spotlight Sale was part of the 50th Anniversary Annual Meeting at Gaithersburg, MD, in 1954. The current judges licensing procedures were instituted in 1958. The first Colorama Sale as part of the National Show was at Columbus, OH, in 1977. That same year the first animals were scored by the Descriptive Classification Program. It was modified to the still used Linear Appraisal Program under which the first animals were scored in 1988. The first AR certificate was issued in 1919 to Maria de Las Cabritas. AR Herd Sire #1 was Las Cabritas Ben Yda based upon records of fourteen daughters made in the Agawam Herd of Charles Stevens, Delevan, WI. The first permanent champions were designated in 1948 based upon rules adopted the previous year. As mentioned earlier, the first Toggenburgs were imported in 1893 and the first Saanens in 1904. The first Nubians were imported in 1906; the first Alpines in 1922; and the first Swiss Alpines which would be bred pure in 1936. The American LaMancha herd book was opened in 1958. The Oberhasli herd book was opened in 1980. The Nigerian Dwarf and Sables were first recognized in 2005.